This small piece of software allows you to convert various formats of SS7 addresses . Many times in my work I have oportunity to convert addreses in SS7 network. This operation is not extremly complicated but can take some time. That is main reason why this small piece of software was created. 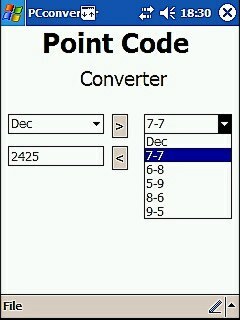 Take a look also for WebPointCodeConverter. Address within SS7 network can be writen in may different formats. Most populars are: decimal and with grouping (e.g. 7-7). If 14-bits address (in my example it’s 8010 – dec format) will be shown in binary format and divided into two 7-bits groups we will get two numbers: 62 and 74. A a result we will get address 62-74. Format 7-7 is one of many formats. Let’s imagine 8-6 or even 8-4-2! The only requirement is that sum of numbers from format description must be equal 17 (e.g. : 7+7 = 14, 8+4+2 = 14 or 8+6 = 14). New: During my last project I discovered that SS7 addressing is not pice of cake I though before… It appeared that in China lenght of addresses is not equal to 14, but 24 bits (with SCCPType == 4). In this case address is represented with grouping 8-8-8. Application allows to convert SS7 adresses between various, widely configured formats. Now it supports only 14-bits addressing. Softare runs on PocketPC hardware and requires installed .Net.